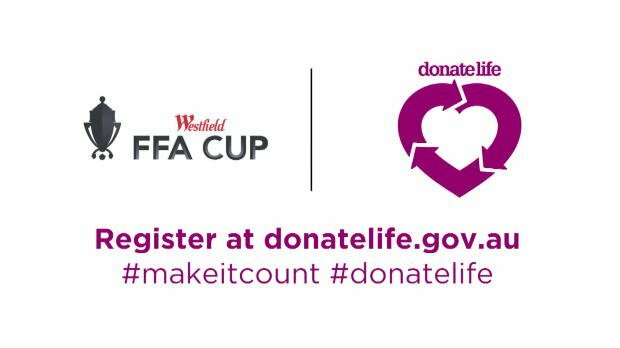 The Westfield FFA CUP is proud to announce our alignment with the Organ and Tissue Authority in 2017. With the launch of DonateLife Week 2017 (Sunday 30 July - Sunday 6 August) we're inviting all Australians to make their decision count by joining the Australian Organ Donor Register. Led by the Organ and Tissue Authority, DonateLife Week is a key part of the Australian Government’s national reform program to increase organ and tissue donation and transplantation outcomes. Registration is important – nine in ten families agree to donation proceeding when the deceased is a registered organ donor. More than 1,400 Australians and their families are today waiting for a life-saving transplant. If you are willing to one day save lives by becoming an organ and tissue donor, please register and discuss your decision with your family and friends. We invite you to register or show your support by promoting the importance of donor registration through sharing this page. One organ and tissue donor can save the lives of up to 10 people and transform the lives of many more. With around 1,400 Australians waiting for a life-saving transplant, and a further 12,000 people on dialysis, the generous act of organ and tissue donation has a far reaching effect, changing the lives of both transplant recipients and their families. Why is it important to join the Australian Organ Donor Register? Registration of donation decisions has a direct influence on our donation rates.Nine in ten families agree to donation proceeding when the deceased is a registered organ donor. This drops to just five in ten families when the deceased is not registered and the family has no prior knowledge of their loved one’s wishes. While 81% of Australians believe that registration is important, only 34% of those aged 16 years+ have joined the Donor Register. To optimise every opportunity to save lives, we are calling on Australians to join the Australian Organ Donor Register (AODR) and to discuss their donation decision with loved ones. Make your donation decision count.